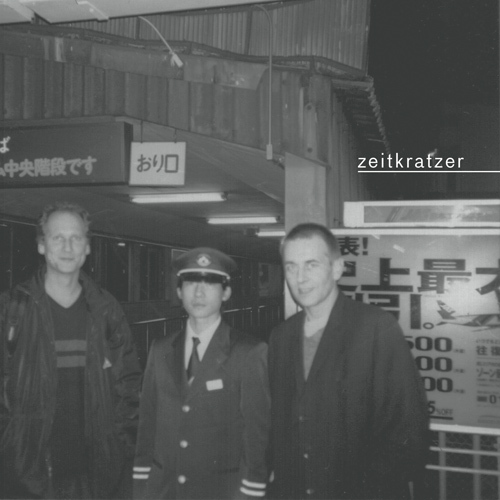 zeitkratzer is a band based on a handful of simple principles. The musicians become the co-authors of the performed composition, while the composer also becomes the performer. The experience of electronic music is rendered by acoustic instruments, which poses new challenges in terms of extended playing techniques. Microphones and speakers become instruments in their own right, while the sound engineer becomes an important member of the orchestra. Accomplished musicians no longer have to master their instruments or even have to be able to read music; instead, they should be experienced and attentive listeners who never cease to learn and expand their horizons. With these several rules in mind, Reinhold Friedl was able to create a kind of perpetual motion machine in search of the essence of sound. zeitkratzer (or "time scratch") is a machine preventing the aging of music by continuously revising and expanding avant-garde concepts. Renowned composers of electronic music (Nicolai, Thaemlitz, Karkowski) and iconoclastic noise (Merzbow and Lou Reed's Metal Machine Music) are approached with a chamber orchestra, while the pioneers of 21 st century avant-garde (Cage, Stockhausen, Tenney, Lucier, Szalonek) are played through a contemporary fullrange sound system. Folk songs are combined with contemporary music and the quasi-cabaret antisinging of Marc Weiser a.k.a. rechenzentrum. Friedl continues the search by Mario Bertoncini (member of the pioneer group Gruppo Nuova Consonanza Di Roma) in the area of piano preparation, and extends pioneering sound transmission techniques (famous Neo-Bechstein first electric piano). In his realization of the opportunities offered by a combination of an acoustic instrument and a microphone, Friedl opened a new chapter of music, making the acoustic band a more effective source of music lava than any electronic synthesizer. Analyzing the differences between the latest performances and those from 13 years ago (Monochrome) and 11 years ago (Xenakis [A]live!) is somewhat inherent to zeikratzer's approach. Both pieces belong to the classical and most frequently performed 'noise' repertoire. Their interpretations have evolved due to changes in the line-up and development of performance techniques. Studio techniques are changing, too, allowing a more precise and more faithful rendering of the full spectrum of sonic nuances and complexity. The pieces play the role of performances where the listener has the opportunity to go deeper into the middle of instrumental theater, 'scratch time' and enter the instrument and its sound, hear muscle movements and feel the sweat on the strings. The first interpretations of Karkowski and the tribute to Xenakis focused on sound intensity and compositional density. Years later, in a completely new mix, they have evolved into sonically enhanced versions, focused on details and space. The successive projects of Reinhold Friedl are primarily lessons in careful listening. Friedl translated a seemingly chaotic sound prank of Lou Reed's (Metal Machine Music) into a multi-layered orchestral composition. He created a parody of Schoenberg's Pierrot Lunaire, highly simplified to confuse the descendants of the original pioneer of dodecaphony (who demanded exorbitant sums for the rights to perform their great-grandfather's work). Impressionistic homage to the works of the Greek composer and architect Iannis Xenakis, the composition Xenakis [A]live! paraphrases the complexity and colorfulness of tape preparations in his Persepolis in a new instrumental language, and demonstrates how attentive and careful a listener Friedl is. He recalls that the idea for this composition arose during work on the interpretations of Lou Reed's work ("Persepolis by Xenakis and MMM by Reed share a similar 'orgiastic' approach, and the experience of sound is direct, immediate and sensual"), and that in the first version of Monochromy, Karkowski just told the whole band to play with the greatest possible force for 30 minutes (which of course was impossible). In this collection, when both tracks are limited in time to their very essence and presented in a multi-layered mix, expanded as a music installation, they allow you to delve even deeper into the story about this expedition into the unknown, into the dense sonic forest of Reinhold Friedl. In 2000, Friedl not only managed to persuade Zbigniew Karkowski to write his first work for orchestra, but also initiated a piece that captured the essence of Karkowski's approach to composition and sound (and encouraged the composer to further research  another electroacoustic composition by Karkowski, Nerve Cell_o was written for Anton Lukoszevieze, zeitkratzer member). For Karkowski, a laptop was just a tool for generating sound, while the PA was the main instrument; the concert was the best form of presentation due to its direct, vivid and fully controlled nature. Monochromy, a seemingly unusual composition by this already iconic artist, combines the compositional formalism of avant-garde with the massive sound. Thanks to the precise dynamics of the acoustic sound, the live performance by zeitkratzer, in line with the stochastic practice of all three composers (Xenakis, Karkowski and Friedl), captures the full spectrum of Karkowski's musical intuition, exceptional in the Polish sonoristic tradition. Im very happy to release two of the most influential zeitkratzer pieces on this record: Zbigniew Karkowskis Monochromy and my own composition Xenakis alive I. Both pieces were recorded live and in early versions. Since then we have played Karkowskis music all over Europe, as well as the final 54-minute version of Xenakis alive entitled then Xenakis[a]live! But this vinyl is dedicated to the early raw versions. The road to getting Zbigniew Karkowski to compose for zeitkratzer was a long one. I met him first in Tokyo around 2000, where he invited me to stay in his flat, and where Francisco Lopez, who by chance was also staying there, shot the photo on the cover at one of our concerts and food tours through the town. Zbigniew agreed then to do a composition for zeitkratzer and we performed it in Berlin at Podewil the following year. It was a 35-minute piece that almost destroyed the musicians. Everyone had to play full force, which was for sure impossible for a duration of 35 minutes. The saxophone player had a bleeding tongue, my hands started bleeding inside the piano, everybody was exhausted and the result not really satisfying. Zbigniew took the multi-track recording of this production with him back to Japan and started to compose a piece out of those recordings. Out came an almost 15-minute version of zeitkratzer  sounds revisited, layered, cut and looped, etc. And that 8-track mix became our new score in a double sense: we used the sound files to transform the wave-forms of the sound editing program into a real music score for ourselves. And so zeitkratzer started to play zeitkratzer playing Karkowski. Zbigniew was enthusiastic about the result, and we found how to play this dense and saturated music without destroying ourselves physically in the first five minutes of the performance. We developed strategies to get through this intriguing composition and to play it at this incredible level of energy. So we owe Zbigniew for not only this wonderful music, but also the inspiration for a new working method we developed over the following years, and that enabled us to play music by Merzbow or Lou Reed and a lot of other great musicians. Xenakis alive was based on yet another approach: I always asked myself why Xenakis never really used amplified instruments (he only did in one little piece) to achieve the incredible sound results that made him probably the most important composer of the twentieth century. As he could not answer that question anymore, I decided to compose this homage and to use the bodies of musicians as random machines: they mostly play some defined sounds and/or noises in a dynamic texture due do the limitations and abilities of their bodies: the length of a bowing arm or the length of a breath, the width of clusters played with one hand on the piano, etc. Out came another approach, of saturated dense structures, intense, loud, always reminding the listener of Persepolis, one of Xenakis greatest electro-acoustic pieces (even so, Zbigniews favorite was always La Légende dEer), once released on a Japanese label with We bear the Light of the Earth printed on the cover: This record is dedicated to Zbigniew Karkowski (14 March 1958  12 December 2014). Contemporary classical music is a nearly perfect system of academic, conservative and restorative attitudes. Being such a hermetical, disciplined, refined and hierarchic tradition, it allows very little freedom of choice and because of being so restrictive in nature, it hardly permits any expansion at all. As a tradition - its a pure embodiment of 19 th century culture and thought. What music needs in order to detach itself and expand from 19 th and 20 th centuries formulas is a shock  a total dissolution and break from classical structures and hierarchies. This has been happening for many years in various areas of experimental music  whatever you want to call it  noise, glitch, industrial, drone etc. By being so open and free and relatively easy to make, and because of this inviting so much talent (contrary to classical music which is still considered to be very difficult to make), experimental music constantly manages to renew itself  while academic classical contemporary music has been rather dead for many years. The concept of zeitkratzer and their working methods is a very important creative and competent attempt between these two worlds and on expanding our perception about what music is and will/can be. It might be just what music needs today.